The deadly freshman 15; loathed by all, evaded by few. If you are entering college you have probably thought about what to pack, what you’re going to study and where you’re going to live, but you may not have given the topic of health much thought. Beginning college is a roller-coaster. In the midst of trying to meet new people and make new friends you will find yourself in many social situations. These situations can involve eating junk food, drinking more than milk, and staying up late: all factors that contribute to weight gain. Another factor to think about is that most students are no longer as involved with sports as they were in high school. This is a change that you should be aware of. In addition, you are coming to a time in life when your metabolism is beginning to slow down. All these factors combine into one, big weigh trap that is easy to ignore until it’s too late. The solution is not to stop having fun in college, but to be smart about the fun you are having. Follow these guidelines to avoid packing on the pounds your freshman year. 1- Don’t snack late at night. Experts recommend that you stop eating 3 hours before your bedtime, so avoid those late night taco shop stops at all costs! Try stocking your fridge with healthy alternatives like whole-wheat pita and hummus, a cheese quesadilla or grilled chicken. 2- Eat 5-6 small meals a day, rather than binging on pizza. This will keep your metabolism going more quickly; if you wait too many hours between meals, your metabolism actually slows down to compensate. Eating more often will also prevent you from overeating, an easy habit to develop if you’re famished because you haven’t eaten since lunch. 3- Eat healthy in the morning (even if you don’t feel like it). Go for egg whites, yogurt with granola or a bowl of fruit. Eating in the morning kick-starts your metabolism and eating right sets you up to eat well all day long! 4- Remember that little things add up. A bag of chips here and a slice of pizza there may not seem like much at the time, but constantly eating junk food (even in moderation) can add up quickly if you aren’t careful. 5- Go to the gym or play intramural sports. Remember, many kids are used to playing sports in high school. They participate in these activities without realizing the great workout that team sports provide. Most kids don’t have the same opportunity to be part of a team in college and it is easy to let exercise get the boot. Stay active by going to the school gym (many schools provide free memberships with tuition) or joining an intramural sport. Being on a team is also a great way to make friends! 6- Keep your metabolism in mind. Some studies show that drinking green tea and coffee or eating spicy food can increase your metabolic rate. However, your best bet is to build muscle (remember, muscle burns more calories than fat!) and to eat every 3-4 hours. 7- Remember that alcohol has calories. For the of-age college students, remember that drinking a beer isn’t like drinking a glass of water. On average a regular beer has around 150 calories and even a light beer has about 100 calories. A 5-ounce glass of wine also has around 100 calories and a shot of vodka can have anywhere from 100 to 125 calories. This is not including any soda or juice you might be consuming with your drink of choice. Always drink responsibly and keep the calories and other negative side effects of drinking in mind if you make the decision to drink. 8- Get enough sleep! 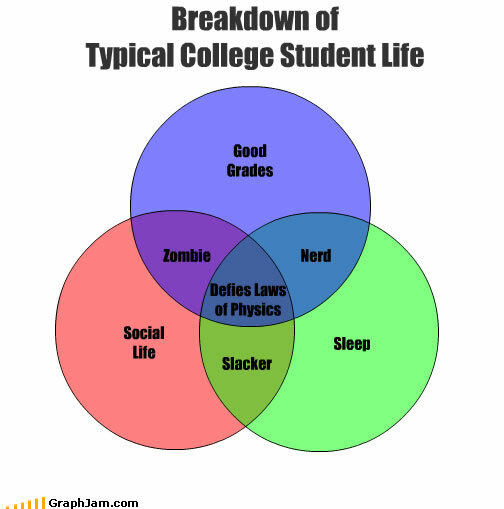 It can be difficult to balance 8 hours a night with class, homework and a social life (as this lovely Venn diagram displays.) Many students give up sleep so that they can stay on top of their studies and continue to have a fulfilling social life. However, loss of sleep will not only make you a less productive student and a less fun friend, it will also contribute to your freshman 15. Studies prove that people who sleep more lose more weight than those who sleep less. The bottom line is to take care of yourself and remember to try your best to keep your social life, academics and health well balanced!